WANG, J. , LI, Y. , LI, H.
In this paper, a performance analytical strategy is proposed for Network-on-Chip router with input buffer architecture. First, an analytical model is developed based on semi-Markov process. For the non-work-conserving router with small buffer size, the model can be used to analyze the schedule delay and the average service time for each buffer when given the related parameters. Then, the packet average delay in router is calculated by using the model. Finally, we validate the effectiveness of our strategy by simulation. By comparing our analytical results to simulation results, we show that our strategy successfully captures the Network-on-Chip router performance and it performs better than the state-of-art technology. Therefore, our strategy can be used as an efficiency performance analytical tool for Network-on-Chip design. G. Schelle and D. Grunwald, "Exploring FPGA network on chip implementations across various application and network loads," The 18th International Conference on Field Programmable Logic and Applications, Heidelberg, Germany, Sept 8-10, 2008, pp.41-46. G. Du, D. Zhang, Y. Song, etc. "Scalability study on mesh based network on chip," Pacific-Asia Workshop on Computational Intelliqence and Industrial Application 2008, Wuhan, China, Dec 19-20, 2008, pp. 681-685. J. Liu, L. Zheng, H. Tenhunen, "Interconnect intellectual property for Network-on-Chip," Journal of Systems Architecture, vol(50), pp.65-79, 2004. R. Marculescu, Y. O. Umit, L. Peh, "Outstanding research problems in noc design: system, microarchitecture, and circuit perspectives". IEEE Transactions on Computer-Aided Design of Integrated Circuits and Systems, Jan. 2009. vol(28), pp. 3-21. C. Chou, U.Y. Ogras., R. Marculescu. "Energy and performance aware incremental mapping for networks on chip with multiple voltage levels," IEEE transactions on computer-aided design of integrated circuits and systems, vol(27), pp.1866-1879, Oct, 2008. P. Lieverse, P. van der Wolf, E. Deprettere, et al. "A methodology for architecture exploration of heterogeneous signal processing systems," Journal of VLSI Signal Processing Systems for Signal, Image, and Video Technology, 2001, pp. 181-190. M. Moadeli, A. Shahrabi, W. Vanderbauwhede, and M. Ould-Khaoua, "An analytical performance model for the spidergon noc". 21st International Conference on Advanced Information Networking and Applications, 2007. Niagara Falls, Canada, pp. 1014-1021. 2007. Foroutan, S., Thonnart, Y., Hersemeule, R. and Jerraya, A. "An Analytical Method for Evaluating Network-on-Chip Performance". Design, Automation & Test in Europe Conference & Exhibition (DATE), 2010. Dresden, Germany, pp. 1629-1632. 2010. T. N. Mudge and H. B. Al-Sadoun, "A Semi-Markov Model for the Performance of Multiple-Bus Systems," IEEE Trans. Computers, vol. 34, no. 10, pp. 934-942, Oct. 1985. Y. Zhang, L. Li, S. Yang, etc. "A scalable distributed memory architecture for network on chip," IEEE Asia Pacific conference on circuits and systems, Macao, China. Nov 30-Dec.3, 2008, pp. 1260-1263. Y. Gao, Y. Jin, Z. Chang. "Ultra-low latency reconfigurable photonic network on chip architecture based on application pattern," OFC 2009, San Diego, March, 22-26, 2009, pp. 1-3. E. Salminen, T. Kangas, V. Lahtinen, et al. "Benchmarking mesh and hierarchical bus networks in system-on-chip context," SAMOS 2005. Greece, July 2005, pp. 354 - 363. T. Huang, U. Y. Ogras, R. Marculescu, "Virtual channels planning for networks-on-chip", International Symposium on Quality Electronic Design, 2007, San Jose, USA. pp. 879-884. 2007. D. Stiliadis and A. Varma, "Latency-rate servers: a general model for analysis of traffic scheduling algorithms," IEEE transactions on networking. vol(1), pp. 111-119, 1996. M. Fabio Chiussi and Andrea Francini, "Implementing fair queueing in ATM switches-parts 1: a practical methodology for analysis of delay bounds," Global Telecommunication Conference, 1997. London U.K., pp. 509-519. V. S. Adve and M. K. Vernon, "Performance analysis of mesh interconnection networks with deterministic routing," IEEE Trans. Parallel Distrib.System. vol 3(5), pp.225-246, 1994. J. Y. L. Boudec and P. Thiran, Network calculus. vol. 2050. New York: Springer-Verlag, 2001. C. Wu, Y. Li, Q. Peng. "Microarchitecture design and performance evaluation of NOC router for multi-processor measuring system," Journal of electronic measurement and instrument. vol 5(22): 101-106, 2008. A. Narasimhan, K. Srinivasan, R. Sridhar, "A high-performance router design for VDSM NoCs," IEEE International SOC Conference. Herndon, VA. 2005, pp. 301 - 304. P. Beekhuizen, D. Fenteneer and I. Adan, "Analysis of a tandem network model of a single-router," ANNALS OF OPERATIONS RESEARCH, vol 1(162), pp. 19-34, 2008. Z. Guz, I. Walter, E. Bolotin, etc. "Efficient link capacity and QoS design for network-on-chip," Design, Automation and Test in Europe, 2006. Munich, Germany. March 6-10, 2006, pp. 1 - 6. 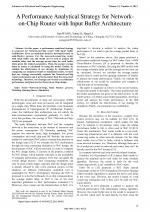 S. Murali and G. De Micheli, "Bandwidth-constrained mapping of cores onto NoC architectures," DATE 2004, Paris, France. Feb 16-20, 2004, pp. 896-901. J. Hu, U. Y. Ogras, R. Marculescu, "Application-specific buffer space allocation for networks-on-chip router design," IEEE Transactions on Computer-Aided Design of Integrated Circuits and Systems, vol 12(25), pp. 2919 - 2933, 2006. J. Wang, Y. Li, Y. Jiang, "Communication performance analytical model and buffer allocation optimizing algorithm for network-on-chip," Journal of Electronics and Information Technology, vol(31), pp. 1059-1062, 2009. T. N. Mudge, H. B. Al-Sadoun, and B. A. Makrucki, "Memory-interference model for multiprocessors based on semi-Markov processes". IEE Proceedings E Computers and Digital Techniques, vol 134, pp. 203-214. 1987. 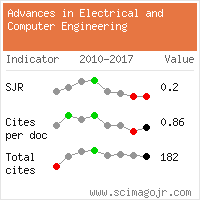 Citations for references updated on 2019-04-22 16:50 in 124 seconds. Website conception, design and maintenance by Eugen COCA. Content updated on 28 Feb 2019. Site engine updated on 28 Feb 2019. This page was generated on the server in 0.121 seconds and loaded in your browser in > seconds.